Once you have achieved a certain degree of prominence, the day comes when you can read more lies and rumours about yourself on the Web than reality even roughly sustains. This is probably because the truth is often not so exciting to capture the most. I'm no exception and even though I think my life so far is extremely exciting, it might not be good for those greedy for sensations. In recent years, I allegedly had 2 heart attacks and was quite incidentally head of the Church of Scientology in Germany. Apparently, I have also worked for the health insurance funds to keep cancer patients from making expensive chemotherapies (incidentally, this is my favourite rumour) and was previously strangely enough years patient of psychiatry. But none of this is true, and sometimes I wonder just how boring life must be for those who have nothing to do than spread rumours about people they do not even know. On the other hand the German newspaper “Bild” does so every day and thus became the best-selling newspaper in Germany. I accept the world as it is and if one does things differently than the mass, there is, unfortunately, thanks to the Internet for people simple in structure the opportunity to play an old game (make others small so that you appear even slightly larger yourself). I can only say I am happy even for the most negative description of my person, because only people with the ball in the hand will be attacked and the old Hollywood saying is true today: "Better bad publicity than no publicity." Born in 1961 From the age of 6 years, I met my friends for many years in the morning and at noon to talk about girls and to play handball and football and to practice Kung Fu. Here we were often disrupted mainly in the morning by a species called teacher, who tried to teach us much useless things. But this could not discourage me from the real important things in life. After 10 Years, I broke off the contact with this species, and later contacted this species only despairingly in the interests of my sons. Oh yes, you certainly want to know if I learned a real trade. To satisfy my mother, beneath the 15-year Kung Fu Training I finished an apprenticeship after 3 years training as a qualified male nurse, and I learned 4 years Transaction Analysis (psychoanalysis). Looking back, I must say, however that my life as a husband, father, and later as an entrepreneur has taught me certainly more than all the official education. I even had a proper job; I worked for many years in the Psychiatric Hospital Winnenden and later for a few years in the Psychoanalytic Clinic Sonnenberg in Stuttgart. My mentor there was the well-known analyst Theodor Seifert. I am grateful for this time, because I saw all depths of the human soul in over 10-years working and therefore I can understand better what at first glance may seem crazy behaviour of some people. 1990 I felt that it would be the time for something else to do with all my energy and founded the Martial Arts Company Hayashi Germany and later the company Budoland, which is now one of the largest of its kind in the world. 1996 I sold my business, backed out from the Sports scene, and intended to make a longer break, after I cared far too little about my family the years before. Then something happened, a friend of mine had a relapse and died in 1997 on his cancer. In my search for help I met Lynne McTaggart known as the author of "What doctors do not tell you, "and Frank Wiewel President and founder of People against Cancer in the USA. Inspired by this great advocate of cancer patients I founded with friends in 1997 “Menschen gegen Krebs e.V.” (People against Cancer), which is today: www.krebs21.de. Then dynamism developed which I had never expected. I was totally infected by the virus called Holistic oncology. For over a decade, I have been travelling around the world to learn about cancer therapies in other countries, while myself becoming a solicitor who informs the people that there is more than chemotherapy, radiation and surgery. And even today the topic of cancer inspires me and especially the many enthusiastic people around the world, as I tried to find out, what cancer is and how it is best treated. My personal knowledge I summarized in the causal research. As president of “Menschen gegen Krebs”, I established 1997 with friends an Association with later almost 2,000 members. In 20 years I had well over 10,000 interviews with patients given up by the physicians and acquired knowledge that not many people can call their own. I was traveling to all continents and to more than 50 countries, especially in whole Europe, many countries in Asia, f.e. more than 10 x to China and of course was seeing so many doctors in America and Mexico. 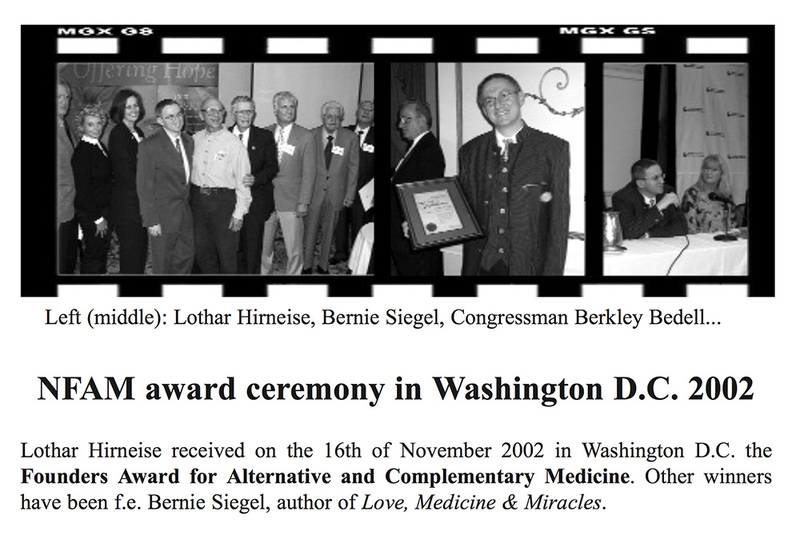 In addition, I worked more than 3 years as Research Director of the National Foundation for Alternative Medicine in Washington DC. In 2001, we organised the first alternative cancer day in Munich and in 2010 we had the 10th alternative cancer day in Stuttgart. Additionally, I wrote THE best seller of holistic cancer therapies in Germany: “Chemotherapy heals Cancer and the earth is flat”, a book with more than 880 pages - and 2013 the worldwide only book about how to do the Oil-Protein Diet: The great cookbook and textbook of the Oil-Protein Diet - with more than 400 color images and more than 340 pages. In 2003, I began to train people as Holistic Cancer Consultants and currently we have more than 100 cancer consultants in 8 countries in Europe. Together with my wife Christina and my best friends Sabine and Klaus Pertl, we organized the biggest project of my life: the 3E-Center in Buoch (www.3e-centre.com and www.theoriginalbudwigcenter.com) a centre where all the accumulated knowledge of the past years should be implemented. But this was only the beginning. From “Menschen gegen Krebs” in 2009 emerged “Krebs21 and I will in future mainly have to worry about that more and more People around the world learned that tumours are symptoms. One day even Politicians and health insurance companies will understand this and it will be only a short way and the first hospitals will treat cancer really holistically. The oncology has only a future if we accept cancer as a disease where body, mind and soul must be taken into account. A future without fear of cancer is no longer a dream. I had also the big luck to meet 1998 the famous Dr. Johanna Budwig and became her only student. I wrote one book with her together (Cancer - the problem and the solution) and made also some speeches together with the "Flaxseed Lady". I am so thankful that I could meet her and to learn so much from her. Unfortunately, for many years, I have observed how other people have destroyed Dr. Johanna Budwig's work after her death in 2003. I know I should have intervened much earlier, but unfortunately there were other priorities in my life. But now, 2017, how Arnold Schwarzenegger would say, „I am back“ and I will not just watch in the future. Together with several other people from European and Asian countries, I co-founded the IOPDF (International Oil-Protein Diet Foundation) in 2012 and I sit there on the Board. The aim of the foundation is to train and pass on the ORIGINAL Oil-Protein Diet, as I was able to learn from Dr Budwig. For this purpose we have developed a curriculum and provide training as Oil-Protein Diet counselors since autumn 2013 (more info at www.iopdf.com). Oh yes, if you will once again read on the Internet that I got follower of an Osho student in India or breed poisonous snakes in Tanzania and work politically or religious than you can be sure that this time again any man wants to escape his depression and does so in the form of journalistic nonsense. Because I intend nothing of that and beside the Oncology, for me it is only interesting to achieve one day 2000 ELO in chess, which is today my Nr. 1 hobby.